Dam construction is a menace to tribal peoples across the world. Once-stable river basins become flooded and river beds diverted as governments look for ways to increase electricity output. Local people usually suffer most, being forced off their land as the resources they depend on disappear or deteriorate. As economies demand more electricity, the solution governments often provide comes in the form of giant, industrial dams, which are enormously destructive to peoples and the environment. Large dams typically displace thousands of people as water submerges their homes and surroundings. The Narmada dams project of central India, for example, is set to force around 320,000 to find new homes whilst many more would have their livelihoods affected. Girl of the Narmada valley, India. Set along fragile river systems, they bring an enormous change in the ecology and overall dynamic of the land and rivers. Large reservoirs, which are created along with dams, are health hazards as stagnant water encourages insects which transmit serious tropical diseases such as malaria. 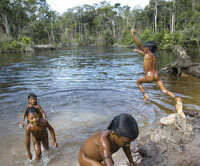 Tribal peoples depend on rivers for food, drinking and bathing water. To many communities, waterfalls and rapids are sacred places. Yet, all too often, the people who stand to lose most are considered least by planners. It is common for no consultation to take place at all with indigenous communities at the heart of the affected areas. From Malaysia to Brazil, new dams are promising electricity to some and devastation to others. 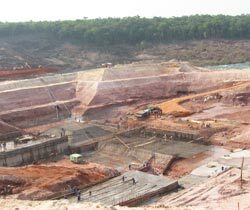 A massive dam called Gibe 3 is being built along the Omo River. When completed it will destroy a fragile environment and the livelihoods of eight tribes downstream which are closely linked to the river and its annual flood. The flawed environmental and social impact assessment (ESIA) claims it is possible to have an artificial flood, but according to the NGO Campaign to Reform the World Bank, ‘in the whole of Africa there is not one hydro-electric plant which has succeeded in re-creating such a model’, due to technical difficulties and high costs. Nor is it clear whether guarantees have been offered that indigenous communities will be able to participate in the regulation of artificial floods and field irrigation. Among other things, the ESIA did not make a thorough assessment of tribal communities’ land use. Until this is understood it is impossible to assess how they might be affected by the dam. Download PDFs: International Rivers Factsheet, African Resources Working Group commentary and Survival’s letter to the African Development Bank’s directors. A series of hydroelectric dams is springing up along the Upper Juruena river that has fed the Enawene Nawe and other indigenous people for centuries. The tribe knows that the fish and quality of the water will be severely affected. Already under siege from loggers, soya production, cattle ranchers and others, they are now resisting this latest threat to their land and way of life. Their recent protest left a dam building site in ruins. It is obvious that they fear their fate is the same as the many other tribal people who have already suffered from such developments. Other Brazilian dams affecting tribal communities include the Madeira River and Belo Monte dams. In 2008, a leaked map exposed the huge dam plans of the national electricity company in Sarawak, Malaysia. The local Penan people, who are familiar with destructive interference from outsiders, now face a new challenge to their land and livelihoods. Blueprints were accidentally posted on the internet for dams that will submerge homes and villages. To make matters worse, these dams are projected to produce far more electricity than Sarawak uses. Let the decision-makers behind dam projects know that their plans in spite of tribal peoples are being watched across the world. Your objection can remind them of the seriousness of their choice. 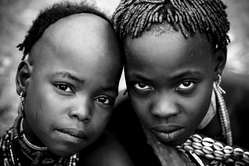 Tell the Ethiopian Prime Minister to halt the Gibe 3. Write a letter for the Enawene Nawe. Send a letter urging the government of Sarawak to recognise the Penan’s rights.